(Click on picture for enlargement. hole which the side of the house faces. Left is another golf hole which the front of the house faces. South and east of the house is common property, which means no building will ever take place there. Our property extends north of the house to about the top of the frame. HSV is somewhat oval shaped. (See the map.) It runs 15 miles East-West and about 7 miles North-South in the middle. DeSoto Boulevard (red-dashed yellow line on map) goes across the width of HSV with only one stop sign along the way. There are no traffic lights in the Village and major streets usually stop only when they cross DeSoto, so travel is pretty speedy in the Village. Access to HSV is restricted by gates at each entrance. The gates on the East side and West side are manned. These are gates visitors would have to come through so that guards can let them in. Other gates are unmanned and are for property owners only. They require an electronic card to get in or out. Development of HSV started in the very early 1970's at the West end of the Village where DeSoto runs into highway 7. With the opening of the Isabella neighborhood in 1998, development reached the opposite end of the Village where DeSoto runs into highway 5. If you have visited other golf course and/or retirement communities, you probably think of such places as being one homogenous development with no separate neighborhoods or subdivisions like you would find in a city. HSV is far too large to be made up of just one neighborhood. Instead, it has dozens of different neighborhoods. 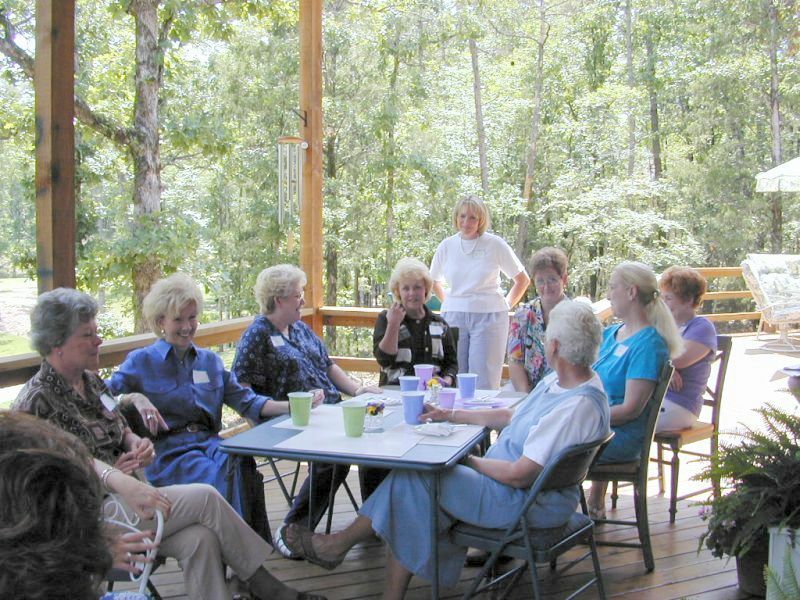 Because 85% of the residents are retired and active, neighbors are much more involved with each other than in urban areas. 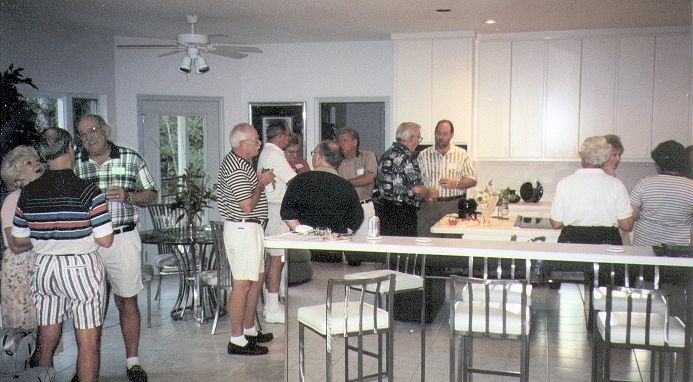 Neighborhood parties, picnics, luncheons, golf tournaments, etc., are commonplace. The DeSoto golf course is on the West side. It was the first course built in HSV. The DeSoto course underwent extensive renovation in the year 2000. The West side also has Lake DeSoto and Lake Pineda, a recreation area including miniature golf and pickleball courts, and some of the best hiking trails in the Village. 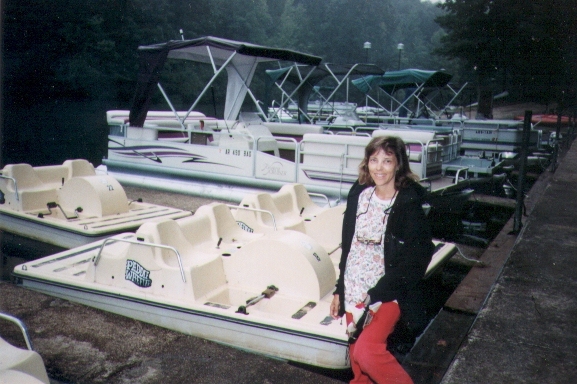 Lake DeSoto has a marina where you can rent boats; in fact, it is the only HSV marina where you can rent paddle boats, as well as kayaks and paddle boards. A swimming/picnic beach is located on Lake DeSoto. Because the West side has been around since the early 1970's, there are many more stores, restaurants, and other commercial developments outside the West gate, making the West end of the Village more convenient. 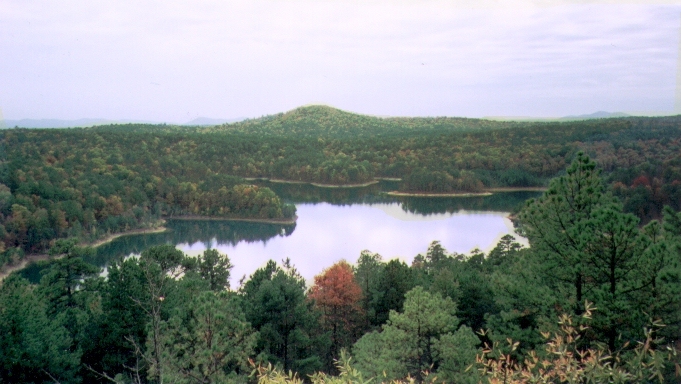 In addition, beautiful Lake Ouachita, the largest lake in Arkansas, and its surrounding State Park are only a few minutes from the West gate. Because of its age, the West side has mostly older and smaller homes. However, there are still many wooded home sites and mountain top sites with fantastic views where new homes are still being built, and many people are now buying older homes and renovating them to have all the modern features while still having all the conveniences of living on the West side. The central areas of the Village are a little newer than the far West end and, being in the middle, are more convenient to both ends of the Village. 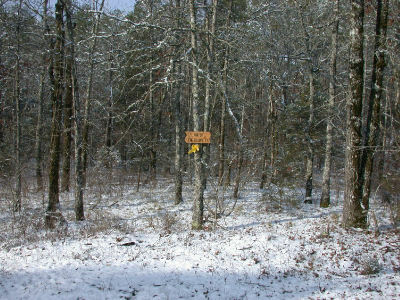 In fact, around the intersection of DeSoto and Minorca, the very center of HSV, are hundreds of heavily wooded lots which have very few houses on them, if you are looking for seclusion and the natural beauty of the forest and wildlife while still being close to everything HSV has to offer. The popular Coronado Center area, with tennis courts (including clay courts), professional fitness center, indoor swimming pool, bocce ball, etc., is in the West side of the Central area. The Coronado Center building has meeting rooms, the HSV public library, and a large dance floor for the many types of dance clubs in the Village. The Woodlands auditorium, where shows and concerts take place, is on the East side of the Central area. Adjoining the auditorium is a building with meeting rooms and the Village Bridge Club. Other than the golf courses, the Coronado Center and the Woodlands auditorium are the location of most activities in the Village. In the woods east of the auditorium parking lot is Grove Park which hosts a Farmers' Market, Artisan Market, and free open-air concerts. South of DeSoto Boulevard is Lake Coronado and the Balboa and Coronado golf courses. North of DeSoto is Lake Cortez and the Cortez golf course. Lake Cortez has a swimming beach. The Balboa and Cortez golf courses were renovated in 2007. Some of the best mountain-view lots are in the Central area, both North and South of DeSoto Blvd. The West end also has some good mountain-view lots, but mountains on the East end are scarce. The East end of HSV has the newest neighborhoods and thus a heavier proportion of larger, more expensive homes particularly around Lake Balboa and in the Diamante neighborhood. Lake Balboa is the largest lake in the Village by a factor of 3 or 4. It has a marina (where party barges can be rented) adjoined by a large picnic pavillion and a sand-covered swimming beach. A trail from the beach crosses the scenic Balboa spillway rapids, site of some whitewater kayaking events. The trail continues along the side of lake Balboa with far-ranging views of beautiful lake-front homes, then continues through a wooded area to where walkers/bikers can eventually can get on the east end of the Hernando Trail which is already the longest trail in HSV by far. Next to the marina is the Last Chance Restaurant -- one of the most popular eating places in HSV. Diamante is a unique HSV neighborhood in that it has a private golf course. "Private" means that while you can play unlimited golf at all the other golf courses in HSV for a flat fee per year or for a low daily green fee, you have to have a high-priced membership (relative to HSV, not so high compared to anywhere else) to play Diamante and pay dues two-and-a-half to three times higher than the flat fee for playing all the other courses combined. You must also own property in the Diamante subdivision. The Diamante golf club is owned by a corporation while the rest of the courses in the Village are owned by the Property Owners Association. The advantages of the Diamante golf club is that it is much easier to get a tee time and the club has a large clubhouse with a swimming pool, restaurant, etc. In addition to the Diamante golf course, the East end has the Magellan golf course, the Ponce DeLeon course, the Isabella course, the Granada course. 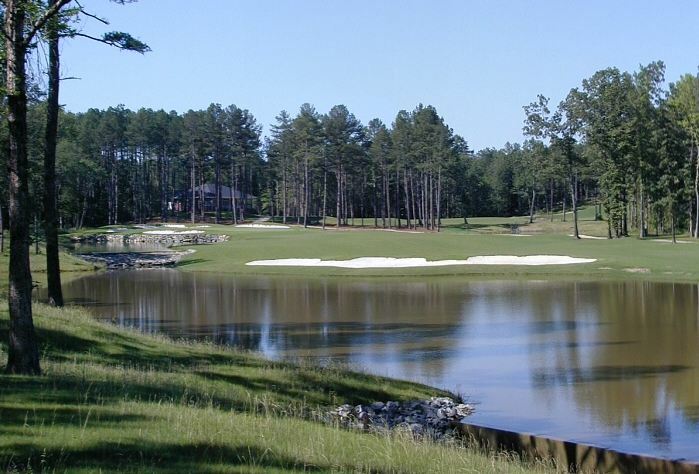 The Isabella course is the only 27-hole course in HSV. The Magellan course was originally the location of a now-defunct golf school, which left behind chipping greens and traps, driving range and putting green which make Magellan the best practice facility in the Village, although Isabella and Granada have better driving ranges. The Isabella neighborhood opened in 1998. It extends to the East gate, mostly South of DeSoto Blvd. It has some lots which are larger than normal (1-3 acres), but still has plenty of smaller lots with 1500-2500 square foot homes. In addition to the golf course, Isabella has a small lake. The Granada neighborhood opened after Isabella. Granada is located North of DeSoto Blvd. on the East end. The Granada golf course was the last one to be developed. The Granada area has several small lakes. Relatively few businesses have located outside the East gate so far. In 2001, a grocery store and several adjoining businesses opened. The city of Benton is only 20 minutes out the East gate (about the same time it would take to drive to the West gate of HSV) and Little Rock is only 45 minutes. Benton is a small town, but has good stores and restaurants and a better movie theater than those in Hot Springs (or in Little Rock, for that matter). The city limits of Hot Springs is only about 20 minutes from either the West or East gates (although more realistically, figure on 30-35 minutes to get anywhere in Hot Springs). (1) The Balboa gate is on the East side, at the south-most end of Ponce and comes out on Hwy. 5. This was once a manned gate. People living in the Magellan and Lake Balboa areas frequent this gate. 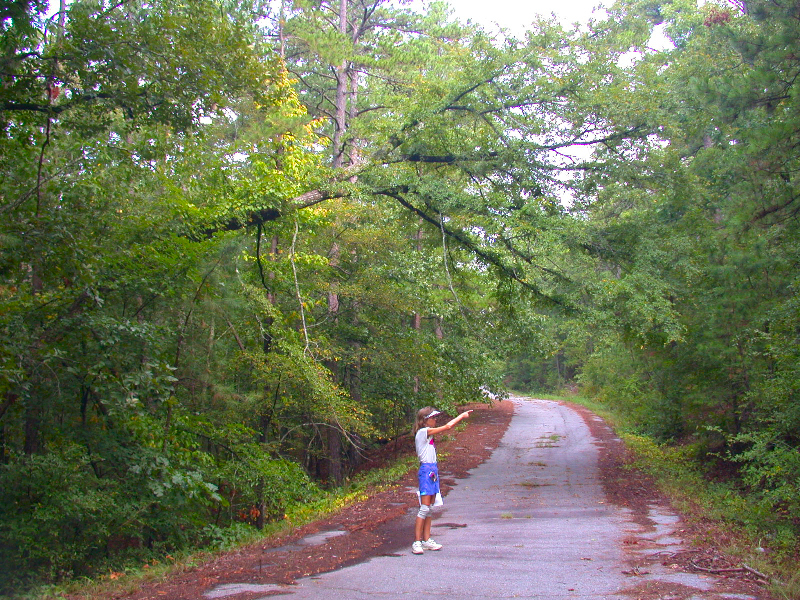 (2) The Baleric-Danville Road gate is on Baleric, east of Minorca. Danville Road cuts through HSV (but is not part of HSV) and comes out on Hwy. 5. It is a shortcut to/from Hot Springs for people living in central HSV. (3) Just across the street from the entrance to the Cortez golf course is a gate which leads to roads which come out on Highway 7 in Jessieville, or just north of Jessieville, depending on which branch you take. (4) The Glazy-Peau gate is west of Lake Pineda, south of Camino. Go to the left after leaving the gate for a shortcut into Hot Springs or go to the right as a shortcut to the Hwy 7 Wal-Mart and surrounding areas. Lakes in the Village are relatively small compared to area lakes like Hamilton and Catherine. Still, even the smallest provide swimming, fishing, and differing degrees of recreational boating (depending on the size of the lake). Lake Balboa is by far the largest lake in the Village. It has newer neighborhoods, and thus lots on Lake Balboa are generally more desirable (and more expensive) than around other lakes. Empty lots on Balboa are becoming more and more scarce. Because a lot of people want waterfront lots and because they are more limited than other types of lots, you can easily pay three or four times or more for a waterfront lot than for even the best golf course or mountain view lots. But you get some of your investment back in the form of free lake water for your sprinkler system and by using the lake water for a geothermal heat pump. You also get the recreational and aesthetic values of being on the lake. Mountaintop lots are something else you can find in HSV and not in very many other golf course communities. Go North on Minorca to Jarandilla. Turn right on Jarandilla and go until you see Mesero on the left. 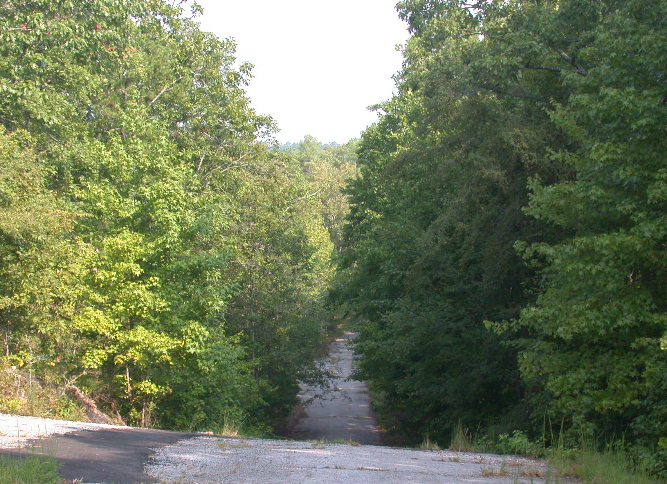 Mesero is just past the scenic overlook road, which may be one of the prettiest views in Arkansas. Turn left on Mesero and enjoy the views. Again, this is just one of many mountaintop areas of HSV with beautiful views. HSV has spectacular golf course lots. The reason is the fairways in HSV are built in the valleys between hills with houses on the hillsides overlooking them. Everyone has seen golf courses on flat terrain where the only golf course lots with good views are the few around the greens. All other lots simply see across the fairway. Looking at 100 feet of the middle of a fairway is not that different from looking at 100 feet of cow pasture. Yet this beautiful, large lot cost much less than smaller lots with only ordinary views which we had been seeing at less impressive golf course developments around Texas and Louisiana. And there are many, many other lots in the Village with equally spectacular views. In fact, lots around the Granada golf course are just off the scale in terms of spectacular views. Actually, every lot in HSV is a "forest lot", covered with trees, but I'm using the term for lots which are not what are referred to as "amenity" lots - mountaintop, lake-front, or golf course frontage lots. 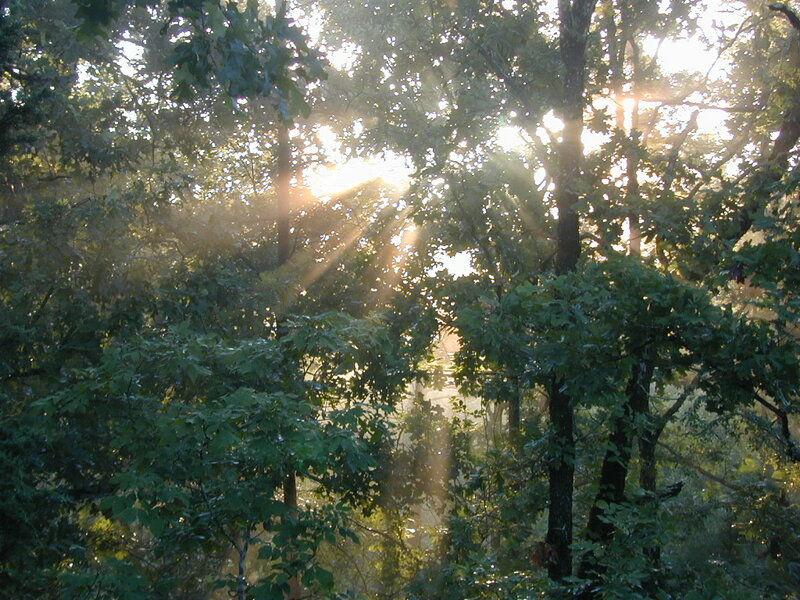 Our lot is a golf course lot, but the picture above was taken in our back yard, and such trees cover our entire lot. There are some neighborhoods within HSV which have been developed by Cooper building spec houses. Usually a large number of homes in these neighborhoods are on forest lots. You can save on these "non-amenity" lots while still being in a nice neighborhood close to a lake and/or golf course. There are also many large sections of forest lots around the Village which have not been developed. So if you would like the feeling of living in a forest with nobody else for miles around while still having the security of a gated community, you can get it at HSV. On the far north-central part of HSV, we have heard that there are 5-acre lots to be had. For example, we have seen one lot there which has a fenced-in tennis court a couple of hundred feet from the house. That has to be a pretty big lot. The vast majority of lots in HSV are on slopes. People take advantage of the slope to have a walk-out basement. However, if you are determined to build on a slab, you can still find relatively flat lots on which to build. 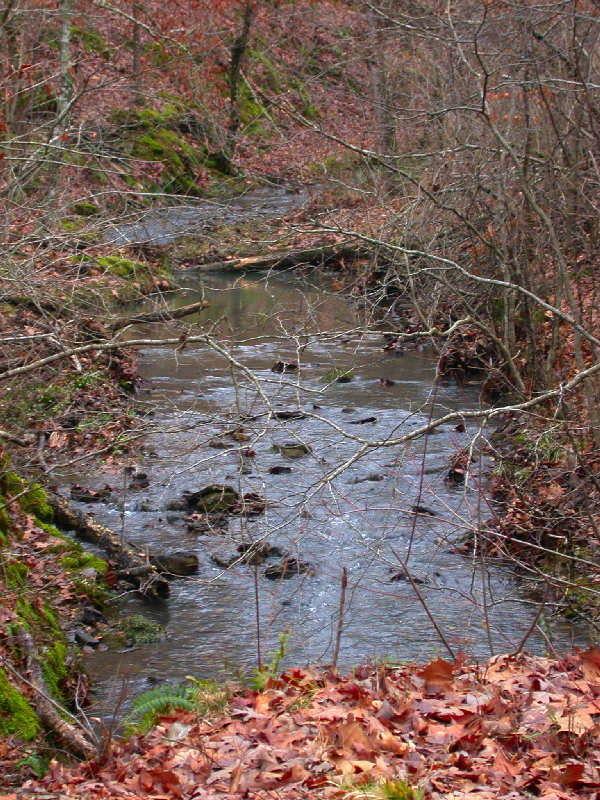 When a relative expressed interest in moving to HSV, she said she wanted a wooded lot with some seclusion. We drove around looking at many areas, wanting to find one as convenient as possible to amenities such as the Fitness Center and the Woodlands Auditorium. It turns out that the intersection of DeSoto Blvd. and Minorca is pretty close to being the center of the Village, and the large subdivisions all around that intersection are sparsely developed. 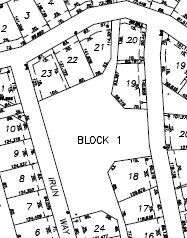 We went online to ftp://ftp.hsvpoa.org/ to look at the plat (lot layout maps) for those subdivisions to find lots of the right size and most common property around them. Then we contacted a realtor, gave her a list of subdivision, block, and lot numbers of lots we were interested in, and asked for a list of those which were for sale (many of which don't even have For Sale signs). We then drove out and looked at the lots, relayed the information to our relative, she made a bid and was soon a proud HSV land owner. The listings at these sites give the sales history of the lot along with other useful information, such as floorplans of existing houses. Although HSV has been around for over 30 years, there are still home sites of all types available, thanks to the vast expanse of HSV. But since HSV is a gated community, you cannot just come up and drive around. However, if you contact any of the local realtors, they can get you in and drive you around to view lots and houses. If you want a golf course lot, try renting a place in HSV for a weekend, play a couple of courses and look for "For Sale" signs around the courses. For other types of lots, you need an agent. It is harder to find the prime lakefront and mountaintop lots available than it is to find a good golf course lot. We mentioned above how we searched for a lot for a relative, who is Kay's sister, Judy. 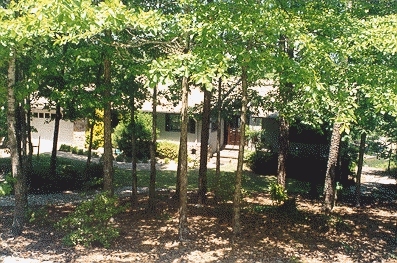 She wanted a forest lot in an uncrowded, conveniently located area which backed up to common property. We started looking in the areas north and south of Coronado Drive between Baleric and Minorca, then moved over Minorca to the Pamplona area. 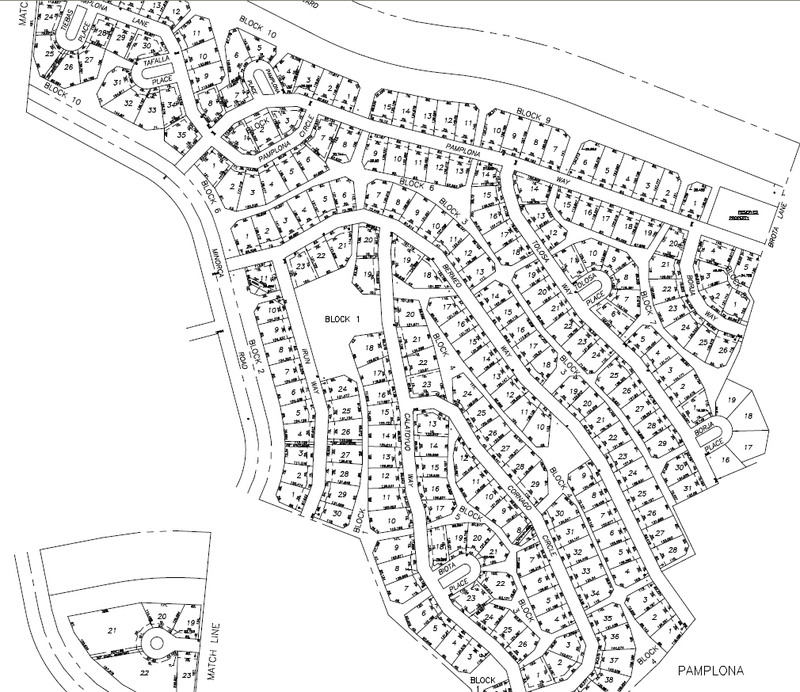 The Pamplona subdivision (click here to see a plat) is one of several subdivisions southeast of the intersection of DeSoto and Minorca, almost dead center of HSV. As you can see on the plat, Plampona is a very large collection of home sites, but it has only a few homes built in it. And it is adjoined by two other subdivisions with dozens more home sites and only a few homes. Walking down (or I should say: up and down) the streets of the Greater Pamplona Area is like hiking through the woods, but on a paved path (the road). 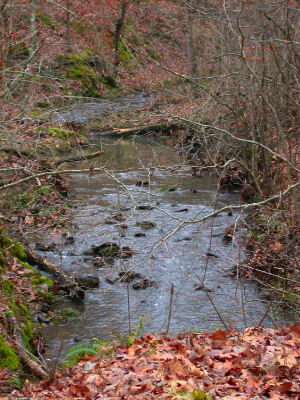 There are all kinds of trees, vegetation (including blackberries and muscadine), wildflowers, creeks and a variety of wildlife (turkey, deer, etc.) to enjoy in your (almost) private aboretum. 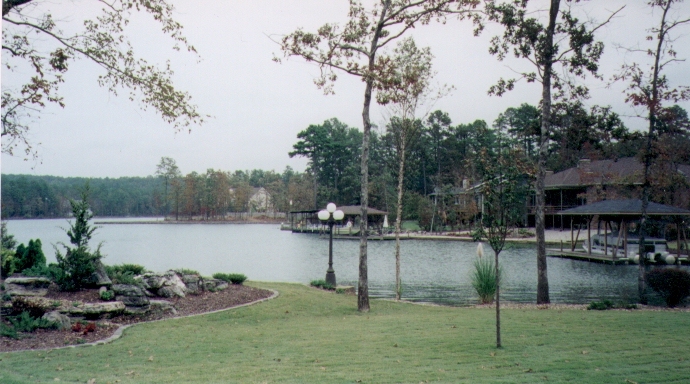 Yet all this splendid isolation, where you might feel you are lost in the middle of a national forest, is right in the heart of the Village, at a major intersection, within minutes of all the HSV amenities such as the Woodlands auditorium in one direction and the Coronado Center in the other and golf courses and lakes all around. 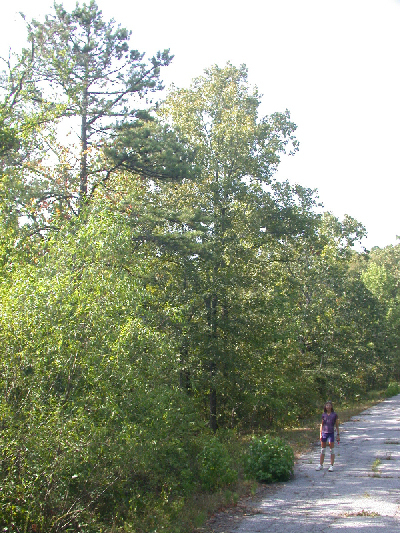 The long Hernado trail is just a couple of blocks north of her and the beautiful Cedar Creek trail, a few blocks south. I'm probably not at liberty to discuss Judy's finances, but let's just say that she got this fabulous, 140' wide lot in the center of HSV for a song. (And this was AFTER the Great California Land Grab inflated the prices of lots.) The simple fact is that even fantastic lots like this are extremely reasonable if you don't have to be on a golf course, lake, or mountaintop.